There are defining moments in history which mark a change in direction. Every generation, every country and every group has some event transpire which encourages belief and galvanises the spirit. In Ireland we are no different. We are a tiny country steeped in a rich and volatile history. Our very recent past has been marked by a viscous recession in the 1980’s, followed by a time of extreme wealth and profligacy in the late 1990’s and 2000’s with a return to the bust cycle and the current austerity and recession. 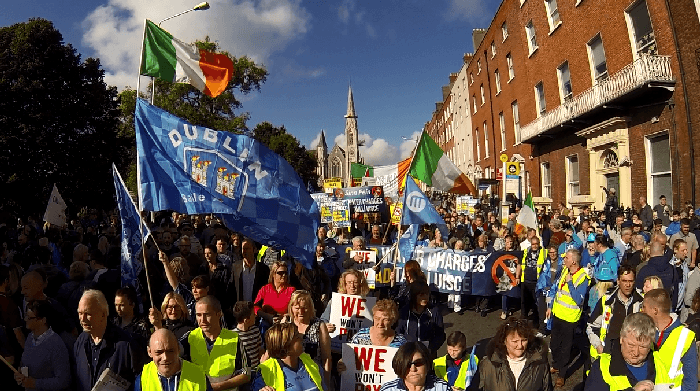 Less than a week ago more than 100,000 people gathered in the centre of the city to protest at the privatisation of the Irish Water Supply. We made a video about the day and the people standing up against the regime. They came from all walks of life, all ages and groups but all shared the same message: enough is enough. For those of you unfamiliar with the story let me do a quick synopsis of how the Irish Government came to be in the position of taking such an action. 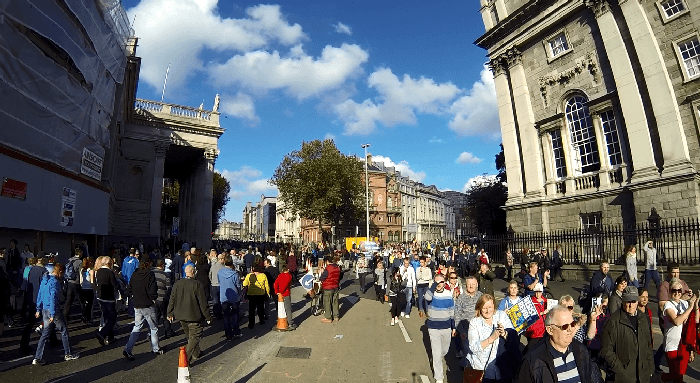 In the aftermath of the Global Financial Crisis of 2008, Ireland was one of the first countries to have to duck for cover. The credit which had been extended and lent for ten greedy long years to the Irish Banking fraternity was retracted. The Government made a decision to guarantee the loans of two bankrupt Irish banks, thereby condemning many generations of Irish taxpayers to pay back billions of Euros which had nothing to do with them. You see, the Irish Government did not come up with this plan all on their own. Their hand was forced by the IMF and the ECB. These two banking conglomerates colluded to ensure that the citizens of Europe would be responsible for the gambling debts of financial institutions. They threatened governments, told them they would be cut out from the system and doomed for a meltdown of gargantuan proportions, if these private investors were not repaid. And so the Irish Government toed the line. When the public heard about this and realised the extent of the damage, they voted out the ruling party Fianna Fáil and put in their old enemies Fianna Gael. What transpired in the following years was that people realised that it made no difference which of these two parties were in power. They had no ideas, no gumption to stand up to the technocrats of Europe and no ability to lead. It was the most virulent and emphatic example of George Orwell’s Animal Farm: Power corrupts all the same. Fast forward a few years to the present day. The Irish people have suffered cut backs to all the sectors of the economy…the sick, those learning and the elderly have all suffered. The poor have got poorer and the sick have got sicker, while a few fat cats lick the cream from the top. The austerity measures which have been enforced from the ruling elites in Europe, have been willfully distributed to the citizens on the ground. It seemed the Irish were taking it on the chin. Maybe it was all the fluoride in the water. Maybe it was the incessant conditioning through the various mainstream media publications and channels. Maybe it was that the people were so depressed that they had lost their spirit. 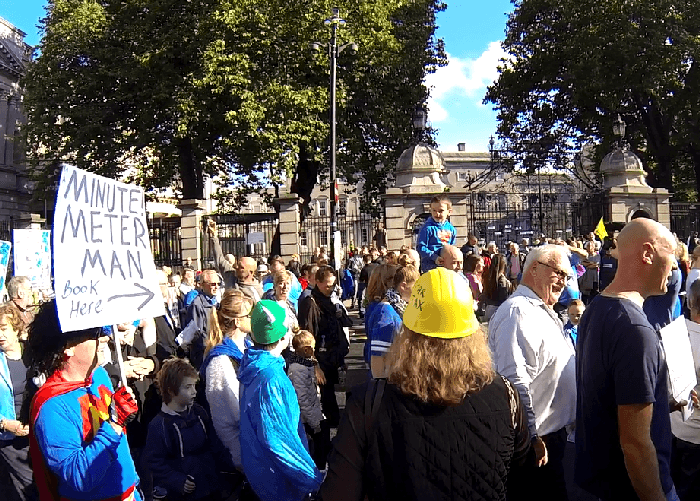 Whatever way you looked at it, it seemed like the Irish people were rolling up their sleeves and accepting the dictates as dictated by their elected Government. Irish Water is a private company which has been set up to charge households directly as per the volume of water which they use. Meters are currently being installed around the country. The company installing these meters is owned by one of the richest Billionaires in Ireland, a Mr. Dennis O’Brien, who also controls a large section of the media in this country. This is not a new tactic. And let me be clear, this is NOT a tactic which the Irish Government came up with. This is something which the IMF and World Bank have been doing worldwide for decades. It is a very simple formula. Convince a country to borrow vast sums of money at high interest rates. Demand repayment. When they fall behind their payments, take their resources. While this might seem a very chunky and simplified formula it is something which you can apply to any situations where the IMF and World Bank have been over the last 50 years. They have ripped up vast tracts of Latin America and Africa in this way. Now it is simply Ireland’s turn. When the people began to realise what was happening here in Ireland they slowly but surely got more and more concerned. Didn’t we pay for water already in our taxes? Hadn’t we been funding the local councils who were administering the water supply already? What gave the Government the right to set up a private company to control this most basic of human rights? And wasn’t the supply of water an essential right for every man woman and child in this country – whether they could afford it or not? So through various groups and concerned individuals a protest was organised. A protest was organised and over one hundred thousand people came to it. It was a peaceful and forceful demonstration. It brought the city to a complete standstill and will have sent a clear message to the obsequious civil servants who are somehow in charge of the ship: Enough is enough. 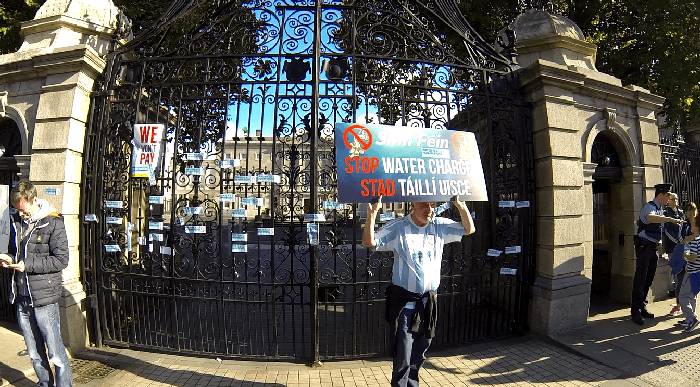 Scrap this water charge and make it work another way. How about writing down some of the billions we are paying back each year on the interest we pay back for private financial institutions? That would be a good start although that would mean having to have some tough conversations with their masters in Europe. Have the leaders of Ireland got the intelligence and the balls to stand up to these vultures who are preying on their meek and servile personalities? If not then I am sure there are people ready to step up to the plate. Ireland is changing. There is revolution in the air. Something which has been dulled down and crushed for so long came alive last weekend…Hope. Every man woman and child who was there felt it. Every person there understood the gravity of the situation. It is time for change. If the current leaders are too blind to see that, then we need to get rid of them. 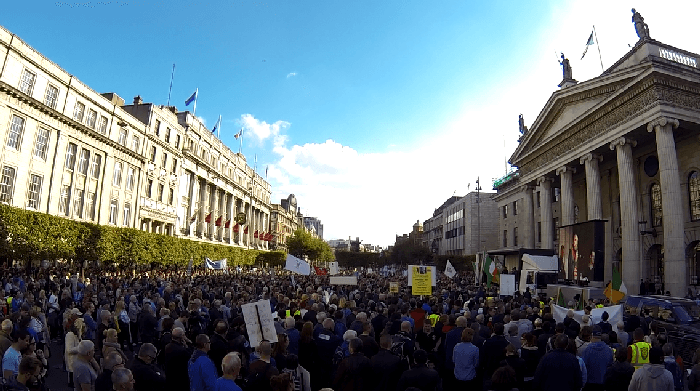 If you missed last week’s protests fear not – an even bigger one will be happening on the 1st of November coming. The 100,000 who came will all be bringing one or two more. Make sure you come along. Be part of something bigger than you. Pssst… If you like this article please help us grow! Share it, like us, follow us, subscribe & connect with us, it all helps!